Albany TV Disposal – Want to Replace Your TV This Holiday Season? By now, you’re Christmas stockings are probably “hung with care.” The question then becomes who is going to hang your new flatscreen television. If you’re like millions of other Americans, you might have treated your family to a new flatscreen HD television. Aside from how amazing the picture and sound quality is going to be on this TV, you’ll also benefit from how little space it takes up. If you’ve got a clear piece of wall across from your sofa, then you can hang your flatscreen up like a painting. With a little extra effort, you can also have all the wires “disappear.” By disappear, we mean snaked through the inside of your walls. To get this job done right, you might want to consider hiring two professionals: One for the installation and one for the old TV disposal. For the installation, you’ll have many options but for the disposal, you should only be calling Junk King. Junk King is part of a national franchise of professional junk haulers who have been clearing out the clutter from homes and businesses since 2005. One of the first things that Junk King noticed about the junk they were collecting is that there were a lot of old TVs being tossed out. A television is not something you can simply put on the curb. Most garbage pickup companies won’t touch it. That’s because it is considered e-waste and has to be properly disposed of. Junk King understands this and that’s why they set up a partnership with a certified e-waste recycling facility here in Albany. They’ll make sure your old television will get to where it needs to go! Along with your old TV disposal, you can also put that Junk King crew to work removing all the rest of your household clutter. By the time the holidays are over, you’re sure to find a lot of stuff you can get rid of. Since Junk King will provide a two-man crew and big truck with any type of junk removal appointment, there is no end to what you can get rid of. As with your old TV, Junk King will also do what they can to make sure the rest of your junk is recycled or donated. When it comes to responsible TV disposal and junk hauling, clearly Junk King is the best company to hire. This entry was posted in Uncategorized on December 23, 2014 by Todd Porter. Last updated August 1, 2017 . You can be a trusting person but that doesn’t mean you have to put yourself at risk. This is especially true every time there is a knock at the door that you don’t expect. Just because someone is on the other side of the door doesn’t mean you have to open the door. If you don’t have a peephole or security camera, you should ask (through the door) who is on the other side. If it is not someone you recognize or want to deal with, simply don’t open the door. You’re not going to hurt anyone’s feelings by being safe. This is the same approach you should take when inviting workers into your home: Trust but be cautious. The first thing you need to be aware of when hiring a service company is their level of professionalism. Someone you find roaming in your neighborhood in a rusty pickup truck might not be the best person for junk removal. Would that person have references? Are they licensed, bonded and insured? Do they have a reputation for exceptional customer service that you can check on the Internet? Those are the kinds of questions you should be asking of your service professional. When it comes to junk removal, the team from Junk King is someone you can always trust. The first indication they are professional is the uniform that the crew members wear. Yes, it’s just a red T-shirt but it sets them apart and identifies them as a member of the Junk King crew. The Junk King junk removal team will be doing all the hard work of lifting and loading for you. This means you can give your aching back a break! It doesn’t matter how heavy something is or where it might be situated in your home, the Junk King crew is going take care of having it removed. They have been trained to handle all types of heavy moving. They also will be able to dismantle and disassemble anything to get it out of your home and make it fit on the truck. You’ll also feel good about hiring Junk King for junk removal because of their eco-friendly disposal policies. 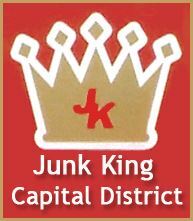 Junk King strives to keep the majority of what they collect out of local landfills. That’s great news for Albany. It’s clear that when you want professional junk removal, the only company to hire is Junk King. This entry was posted in Albany Junk Removal Team and tagged Junk King, junk removal on December 18, 2014 by Todd Porter. Last updated August 1, 2017 .